Oak Hill operated near the center of Temple Village. It was open from just after World War II to around 1950. It was a typical small area, with an open slope and two trails. A warming hut and lunch bar provided services to cold and hungry skiers. 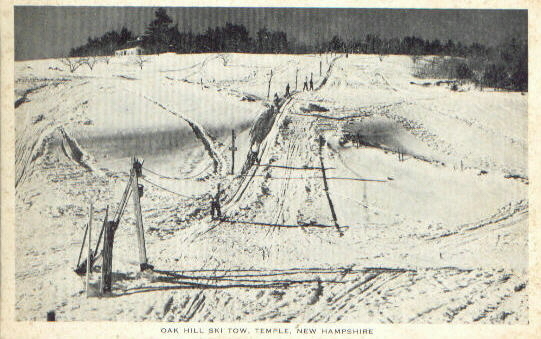 Here's a shot of the rope tow, postcard courtesy Laurie P. Note how it was simply a farmers field with maybe 150' drop. Do you have further information on this lost area? If so, let us know.